One thing to remember, do not change the controller on a bootable drive without going through the special procedure using msconfig.exe to set the system to boot into Safe Mode after your change the setting in the Bios. You seem to have gone down a Rabbit hole and hard for me to follow where you are. Do you currently have a system booting to the PCIe NVMe drive in Secure Boot mode? The external drive should not even be attached during this process. Changing from RAID to AHCI changes the controller for both drives but the big difference is it allows the M.2 slot to function as PCIe. The system, in order to boot a PCIe drive, has to use the UEFI boot configuration. I would ask, you try to get the system back to a normal state. If the SSD is capable of running it will be seen normally. If it is not, you may not be able to get it installed but it should be seen when connected to the SATA cable in either RAID or AHCI since they are both SATA controllers. Hey thank you for the reply. Like you, I have an understanding of UEFI, Secure Boot, SATA, M.2 (NVMe), AHCI, and "Raid" (according to Intel) and the relationship between those technologies and successful use of them in concert with all of the available options. Addressing your points. There has never been an external drive in use in any parts of discovering the issue, or in diagnosing it either. The issue is with the Internal SATA port on the motherboard. I had already installed the appropriate drivers via the Safe Boot method you describe and have been safely able to switch between AHCI & RAID modes arbitrarily for some time now without having to go back into Safe Mode. Once I make the switch in BIOS, Windows "just boots" and otherwise operates normally with the NVMe drive. Changing the AHCI/RAID mode was meant to figure out what's going on with the SATA port. The original issue is the SATA port only sees HDD type SATA drives, not SSD type SATA drives. By testing thoroughly, I've eliminated the M.2 NVMe drive as a cause for problems as I can successfully reproduce the inability for the SATA port to work when only a SATA device is connected. I successfully installed Win10 onto the SATA HDD while the Win10 installer can't see the SATA SSD. The point of testing installation of Windows to HDD was to eliminate an issue where my existing Win10 installation on the NVMe could be causing the problem - i.e. "Start Fresh to see if problems persist". Turns out the issues manifest far before a normal Windows installation has occurred. I'm able to reinsert only the NVMe drive and boot Windows without issue at any time. It has performed an exemplary job the entire time. I've never changed UEFI/Legacy boot modes, it has been UEFI the entire time. 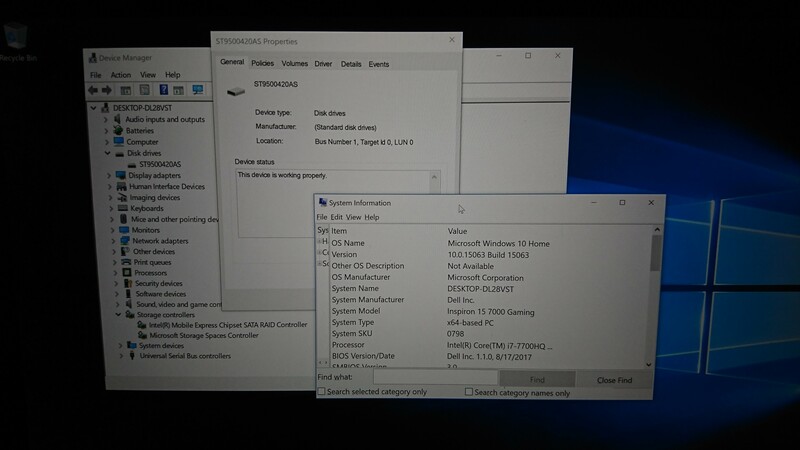 As I've typed this, Windows 10 just finished installing on the HDD with the NVMe drive disconnected. The problem is clearly how the SATA port handles SSDs. There aren't any other variables I am aware of to check. I've eliminated the last variable: does the SATA port work at all? It does, but only with HDDs. I'm actually on 1.1.0 , release date 8/17/2017 (according to SMBIOS). Brad, I've PMed you the requested information. Thanks everyone! 2. HGST 1TB HDD ...result same bios and windows does NOT see it. This issue is getting very frustrating as I have updated all windows updates. I do try your Dell SupportAssist and it finds a SATA driver that needs updating (15.7.3.1019, A01) however every time I update, it seems too quick to install and asks for a reboot. Upon reboot, it still shows up as available update aka needs to be installed again. Please help with this issue. On the verge of returning this, as on first startup I noticed horrendous wifi speeds with the included intel 3165 adapter. I already had to purchase a new m2 wifi card intel 8265 as before the 3165 was limiting me to 10mbps on my AC backbone with gigabit internet. now I get 400+mbps with the 8265. How do you have the SATA controller configured in the Bios? If you have not modified your system's configuration then it is set to RAID. I assume you can still boot normally after adding the second drive on the SATA cable but you can't format the new drive? SAME!!!! just bought the 7577. cant figure out why it wont accept my secondary ssd? I called dell, but that was an absolute joke. between their service, problems with m.2 drive running slow and now this issue with secondary ssd drive. I think im taking it back and going with a diff brand.